The flooring of the house is something that will either make or break the design of the house. Now the question arises which is the best flooring material? The Indoor and outdoor stone pavers are very commonly used options as floorings. Wondering what are pavers? Pavers are basically slabbing and blocks that are made from different materials. They are used to create driveways, patios, pool decks, and more. #1. Bricks: Bricks have been used as flooring for centuries. The bricks can be laid in varied patterns and color combinations. They are the best alternative to concrete. They are natural material and they can be reused and are an eco-friendly option. They can also be mixed with the flooring materials in order to create a stunning indoors as well as outdoors. It is mainly done to prevent dirt that may go deep into the porous surface. They can chip over a period of time. #2. Concrete Pavers: They are manmade pavers that can adopt a wide range of colors, shapes, and sizes that make it a wonderful choice for decorative flooring, and they have an array of design possibilities. 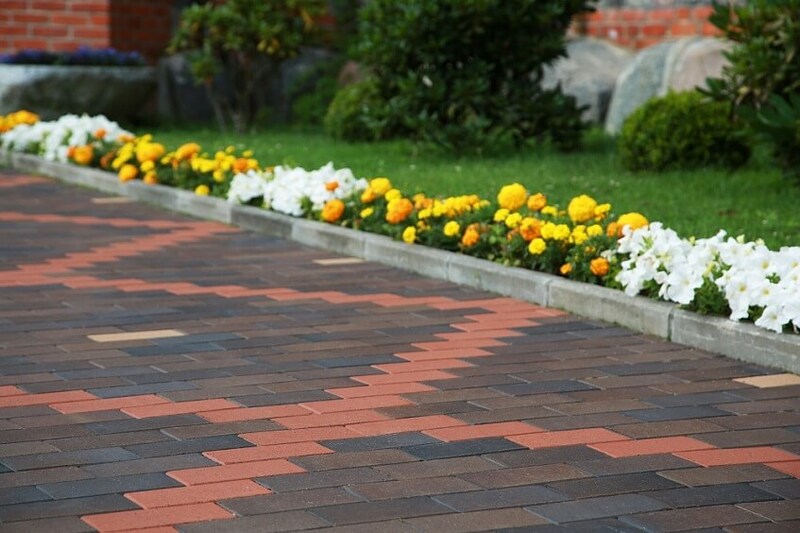 These pavers are collectively strong and can withstand both the elements and the test of time. they are very easy to install in comparison with other pavers. Your paving project can last decades if you use concrete pavers. It is low maintenance and cost-effective option. This is the reason why concrete is gaining popularity as Indoor and outdoor stone pavers. #3. Porcelain Pavers: The porcelain pavers that are chosen as Indoor and outdoor stone pavers are similar to the natural materials as stone and wood. They are in fact tough and can stand up the waters and the scratches. The porcelain pavers used for Indoor and outdoor stone pavers are usually made from the kin fired clay. They are basically a green alternative and are available in unlimited supply. It is very durable in comparison to wood. Water and oil spills can be easily cleaned from these pavers and they are staining resistant. These pavers are resistant to fade, and their colors remain fresh for many years. They can either be rustic or elegant, but this will completely depend upon the taste of the customers. #4. Natural Stone: The natural stone is considered to be the best choice for Indoor and outdoor stone pavers. This is more because they are available in a wide variety. They are incredibly strong and close to the original as compared to the concrete pavers. The use of stone is unique, and many color combinations can be incorporated into a design that will add to the organic beauty of the floor. The natural stone used as pavers is timeless and also thrives on contemporary designs. This, therefore, matches with the latest landscape designs of the property. It does not require a lot of maintenance, so it is an affordable choice. It adds to the exclusive value of the property as they will never fade over the period of time. #5. Bluestone: It is a variety of sandstone and is used to create elegant and sustainable driveways. It comes to a wide range of sizes and shapes and offers a unique look because of the magnificent color. The stone paver that is chosen for the house or office has to be appropriate for space, for example, the pavers in the bathroom and the kitchen should have a non-slip surface. You can use any of the mentioned indoor and outdoor stone pavers but make sure to buy original ones only from a reputed seller.